March 16, 2017 – IK Multimedia is proud to present the new Fulltone® Collection for AmpliTube for Mac/PC, which offers guitarists and all musicians an essential palette of sounds that span from classic to contemporary tones. IK Multimedia’s Fulltone® Collection includes 3 powerful processors that are equally at home in music production as well as in creative sound design. Guitarists, keyboard players, composers, producers, sound designers and mixing engineers can now take advantage of all the mojo and feel of the original Fulltone hardware but with all the practicality of AmpliTube’s well-known ease of use. Recreated by Fulltone and based on the original, nearly impossible-to-find Dyno My Piano unit (sold during the 80’s as Songbird or Dytronics), the TERC gives you that lush, expansive, huge and elegant chorus sound that made it so famous during the 80’s and was regularly used by some of the world’s top session guitarists such as Michael Landau, Steve Lukather, Dann Huff and many others. Despite its typically retro character not only is the TERC still very modern, but its timeless sonic signature works wonders on all kinds of material. The Solid State Tape Echo captures the full essence, warmth and vibe of the original Echoplex EP-3, but without its unavoidable drawbacks – the original unit was very noisy, featuring low-quality tape heads and would produce lots of hum. Fulltone’s SSTE fixes these issues, greatly enhancing the machine’s response and capabilities. IK Multimedia have recreated the SSTE in virtual rack format with added bpm sync function, offering ultimate DAW integration and sonic versatility. The OCD overdrive pedal is already a classic. It gives the sound more grit, punch and the same kind of touch sensitivity, warmth and complex harmonics that characterize a quality tube amp. 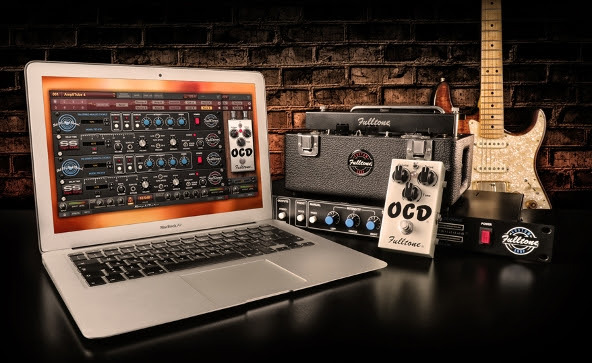 The OCD is the “icing on the cake” that makes the Fulltone Collection perfect for all genres and styles of music.